Was this Batman’s batmobile before he was Batman? I saw this parked on the sidewalk and had to take some pictures. The owner is clearly a big fan of Anpanman, the most popular anime character among Japanese kids. Anpanman is everywhere in Tokyo, but I’d never seen a fully tricked out Anpanmobile before. Maybe I just didn’t pay attention before my friend Amritha visited and opened my eyes to the utter coolness of Sweet Bean Bread Man (the literal translation). •	The character was conceived by Takashi Yanase when he was a starving soldier during World War II, fantasizing about the tasty snack. •	In the story, Anpanman was created when Jam Ojisan, a baker, had his batch of sweet bean pastries struck by a falling star. •	Throughout his adventures, when Anpanman gets injured, new heads are baked by Jam Ojisan. •	Anpanman’s nemesis is Baikinman, or Germ Man. His fatal weakness is soap. •	There have been over 1,700 characters in the Anpanman series. Most of them are some form of food. •	Over 50 million copies of Anpanman books have been sold. 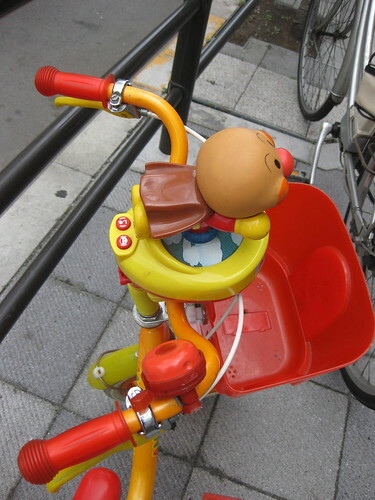 Batman may have a more powerful vehicle, but in terms of coolness, it can’t touch this Anpanman bike. 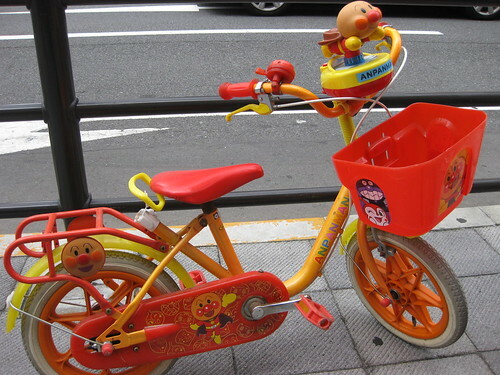 We have an Anpanman tricycle here in Los Angeles that we brought back from Japan. JJ still has the Anpanman that Tomoko’s family gave him! I haven’t seen any Anpanman in California. These might be the only Anpanman objects in California. You both should put up pictures. Next Next post: Does Obama Deserve the Nobel Peace Prize?